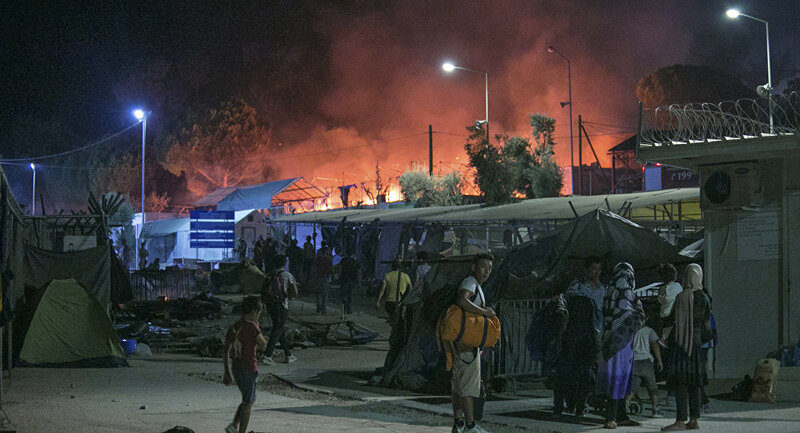 ATHENS (Sputnik) — Asylum service buildings at Moria refugee camp on the Greek island of Lesbos have been set on fire, as hundreds of migrants protest over the long stay in the camp, local media reported on Monday. According to the Athens News Agency, a large number of migrants, mostly from Pakistan, came out to protest against delays in the examination of asylum applications. Asylum Service employees were forced to leave their offices, which were set on fire during the protest. The fire brigade is currently at the hotspot trying to extinguish the flames, while the riot police has entered the camp in an attempt to restore order. Around 60,000 refugees are estimated to be stuck in Greece. The country is the main transit point to Europe for refugees coming across the Aegean Sea from Turkey. Those who arrived after March 20 are supposed to be returned to Turkey as part of a deal between the Brussels and Ankara.